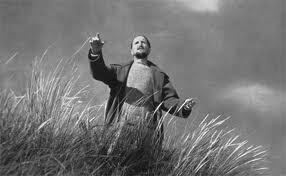 I have had Carl Theodore Dreyer’s Ordet (1955) sitting on my DVD shelf for a few months now. For some reason it is one of those films that I would just never get around to popping into the player, perhaps thinking that it looked a little slow and boring. Well I finally got around to chucking it on the other day and man am I glad I finally made the effort. This film is a phenomenal exploration of some weighty themes, family and faith chief amongst them. The film takes place on Borgen farm where an entire family resides – the family patriarch and his three sons, one of whom is married, another whom is mad. This mad brother believes that he is Jesus Christ returned to earth. One of the great accomplishments of the film, in particular its script is that there is no single protagonist. Rather, the viewer becomes caught up and utterly engaged with the arcs of a whole bunch of characters. The youngest brother Anders, who wants to marry but is rejected by both his father and hopeful father in law. Mikkel who has rejected his faith. Johannes who believes he is Christ. The caring and heavily pregnant Inger. And finally the family patriarch Morten, the eldest amongst them, but in many ways the one most capable of change. It is difficult to give a plot synopsis of the film that does the film justice. It is a character study of all of these characters. It is also a really intense exploration of the theme of faith that manages to straddle both a time past where faith was the norm and an increasingly logical world. There is incredible depth and nuance to the themes of faith in the film. Ones that can perhaps not be totally absorbed in a single viewing. The power and frustration of prayer is explored. Johannes is a gifted religious scholar who has seemingly been turned insane by his studies or perhaps the pressure of his father who saw him as no less than a “renewer” of the Christian faith. The possible inherent ‘craziness’ of a belief in God. The relationship if any between the ideas of faith and of ‘goodness’. The difference between a blind and shallow faith in God and a deep thinking, exploratory faith. Perhaps more than all of these is the theme of religious intolerance that runs through the film, especially professed by the subplot of Anders’ love for Anne and their attempts to become engaged. It is incredible just how relevant today a number of the themes explored here are. I can understand how heavy and boring a lot of this can perhaps sound. But it is not, and it is a testament to the script that you will find yourself never less than enthralled and engaged by it all. There is a lightness of touch in bringing all of this to life and also a great balance between thematic exploration and narrative. The film is beautiful to look at. It is rural life rendered in phenomenal sharp black and white cinematography. 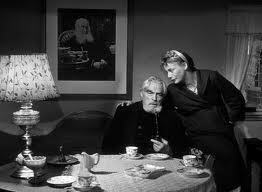 Dreyer’s direction is really great at conveying place through the shots that are chosen. See the opening sequences conveying the rural, the windswept and the dunes. Matching the cinematography is the sound design. The incredible whistling of the wind in the early scenes and some really innovative flourishes throughout the film. Sounds that spill over from one scene to the next for example. The performances are all excellent. Emil Hass Christensen as Mikkel has a stoicness that is more than a little reminiscent of Max Von Sydow in The Seventh Seal (1957). Henrik Malberg who plays Morten Borgen is an absolute stud of an actor, he is grizzled yet deep thinking with his “peasant’s pride”. Perhaps best of all is Birgitte Federspiel as Inger, the female focus of the film who goes through so much but who is an incredibly strong feminine figure. Put simply, Ordet is one of the greatest films I have seen for a very long time. It may not be for everyone, but if you are into ‘classic’ cinema especially if you have the patience to go along with something slow moving and spiritual, then this one is definitely for you. This is an at times harrowing watch with some crushing moments, but it is well worth investing the time in. Thanks, I must watch this one. Thanks TIm – will check it out. Cheers Julie. Hope you enjoy (I think you will).